Is Barclays Bank going to provide new Antivirus for free? Hi guys I have been using Barclays Free Kaspersky Internet security software for years but unfortunately they have stopped it. I work in IT and i use sophos at home to monitor all my 4 machines Widows 7, 10, server and mac. that sounds like a security risk in itself. yes its free but its not that strong. Guessing you dont know what your are talking about and/or not even looked up sophos. Guessing you dont know what your are talking about and/or not even looked …Guessing you dont know what your are talking about and/or not even looked up sophos. "..you can monitor them all from one location.."
I don't use any antivirus myself and just run the security updates. I'm only following what I hear on tech podcast. I've been hearing for several years not to use kaspersky but only now as it become more public. So much marketing and to big of industry to let it go quietly. Still.. Everyone must make their own mind up and do what they feel is right..
you ever wonder how big companies monitor there 100s of machine on a network to see what machine may have issues? or so you think they trust the users to flag up there machine if they have an issue or virus. i am saying any software package (regardless of type) that allows access to a number of networked computers at the same time is a very big potential security risk. if i was you I would look at the news and then see if you still want to use it, really not worth it and one reason Barclays did the decent thing. Op try Avira its one of the top AVs and free, been using it for years and its excellent. AVG sells your data, has not been one of the best AVs for a few years because of that. if i was you I would look at the news and then see if you still want to …if i was you I would look at the news and then see if you still want to use it, really not worth it and one reason Barclays did the decent thing.Op try Avira its one of the top AVs and free, been using it for years and its excellent. Yep and that’s something that if it concerns you then it’s the same as Kaspersky but from my side we have a choice which AV to use many don’t have a choice between windows and yes there are other options out there but most wont use them. But if I had a choice which I do, I would prefer Russian hackers whether it’s true or not not to have access when there are plenty of alternatives. Yep and that’s something that if it concerns you then it’s the same as Kas …Yep and that’s something that if it concerns you then it’s the same as Kaspersky but from my side we have a choice which AV to use many don’t have a choice between windows and yes there are other options out there but most wont use them. But if I had a choice which I do, I would prefer Russian hackers whether it’s true or not not to have access when there are plenty of alternatives. Ok I will ignore all other outlet’s and use your opinions from now on. We can all educate ourselves yours is not the only opinion that is valid you know. Ok I will ignore all other outlet’s and use your opinions from now on. We c …Ok I will ignore all other outlet’s and use your opinions from now on. We can all educate ourselves yours is not the only opinion that is valid you know. So true but sadly I was not being sarcastic. we can all use the term scaremongering or call for education or try to have a go at someone on a forum where we seat behind a keyboard not knowing what the background of the person is. but we don’t have to force our own views on someone just because we think the person is wrong, we are free to do what we want. We may not agree but don’t bring education or intelligence into it because at the end of the day opinion is free no matter what your educational background may be. Have a good night my friend. Just use Windows Defender applied with some common sense and you won’t have any issues. 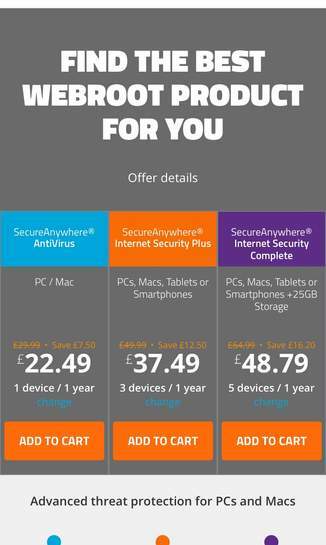 One i did not say "not the best security software available" what i said was "OK sophos is not the best anti virus"
yes there is some better anti virus out there but cost you ££ for home users. but the user is asking for Free anti virus. also sins Sophos was built for Business users and they have now allowed home users for it for free it still beats some of the paid anti virus programs out there. just look at Kaspersky it was one of the top but now sins anyone jumped on it. it ha slipped down the list. this is true most anti virus software is around 6 months out of date for small viruses. meaning a new virus can take 6 months before before the software can even pick it up. that cos the company need to check out the virus, see how to remove it. will it affect anything if removed and so on before they can add it to there software. MY macbook is what 5-6 years old not one issue found on it and runs just as fast as it did when new. My windows laptop(win 7) is 5-6 years old also, it had has virus, pop up and allot of issues, even after a reformat and windows updates. this machine is so slow it cannot stream 4k videos, even updated the HDD to SSD and still cannot do it. (ok the macbook was around £400 more). if i install a Linux on to the windows machine and it works fine. I should say this was from my GF that used the macbook and windows laptop. Edit: sorry the macbook was affected by ‘Meltdown' and 'Spectre' (one was patched before it was in he papers and other was a 4 days later) but this affects everything that used microprocessors from Intel, AMD and AMR, so affected everything(phone, TV's, computers and so on) from the last 10 years or so. Seems like a possible Webroot free version? Barclays Kaspersky now updated free for a year. just click on renew and entered my details and got a free activation code in my email. so i guess it free now? Barclays Kaspersky now updated free for a year. just click on renew and …Barclays Kaspersky now updated free for a year. just click on renew and entered my details and got a free activation code in my email. so i guess it free now?